Radio astronomy reveals the hidden Universe. 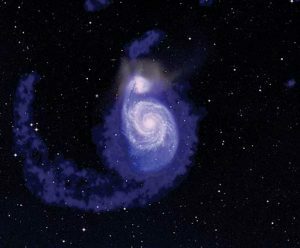 In radio waves (blue), the Whirlpool Galaxy is a lot larger than it appears to optical telescopes (white). We see the world around us, because our eyes detect visible light, a type of electromagnetic radiation. Objects on Earth and in space also emit other types of EM radiation that cannot be seen by the human eye, such as radio waves. The full range of all radiating EM waves is called the electromagnetic spectrum. With giant, sophisticated radio telescopes, we watch stars turn on, shine, and expend themselves, and then we spy on their fascinating corpses. We watch planets form from dust and ice. We clock the spin of our Galaxy and thousands of others. We see the echo of the clumpy Big Bang and the Universe’s very first stars and galaxies. And we spot the chemical precursors of DNA, floating in space. Since radio waves penetrate dust, we use radio astronomy techniques to study regions that cannot be seen in visible light, such as the dust-shrouded, busy center of our Galaxy, the Milky Way. Radio waves also allow us to trace the location, density, and motion of the hydrogen gas that constitutes three-fourths of the ordinary matter in the Universe. 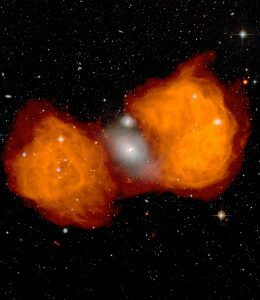 Fornax A is a galaxy with a very active black hole in its core that is spraying radio waves out into enormous jets. Here, the white glow in the center is the visible galaxy NGC 1316 that you can see through the constellation of Fornax. Notice the wee spiral galaxy above it? These two galaxies are merging, and as gas and dust are stripped out of the small galaxy and poured into the center of NGC 1316, the black hole nestled there spins it up. How do we know this? The huge radio lobes to either side of this merger are the telltale signs that a black hole is being fed more than it can handle. These are the billowing ends of powerful jets shooting out spun-up, escaped material far into space. In the late 1920s, Bell Laboratories began planning a system of transatlantic wireless communications. They needed to know about sources of radio waves that might interfere with their plans, and put a young physicist, Karl Guthe Jansky, on to the task. In 1930, Jansky built his now famous “merry-go-round,” a bridge-like structure that held antenna wires set on a spinning base. A motor turned his merry-go-round throughout the day and night to listen for radio static interference, and indeed, he found plenty coming from distant thunderstorms …and the center of our Galaxy. A radio antenna had shockingly discovered radio waves coming from space, turning it into a radio wave detecting telescope. And that’s how we came to call our field of science radio astronomy!